Undoubtedly, most investors were hoping that the first rally of the New Year was going to stick around for more than just a few days. The jury is still out whether or not the market is going to continue its bearish trend. But, the surprising news from Apple (NASDAQ: AAPL) certainly casts a shadow over the brief glimmer of hope from investors. In case you missed it, AAPL preannounced poor earnings based on slower than expected sales – primarily in China. The company lowered revenue guidance for the first time in 12 years and it sent a ripple through the markets. If one of the largest companies in the world is struggling, what’s that mean for everyone else? It does seem to show that the trade/tariff war between the US and China is having real consequences on American companies. AAPL shares dropped 10% on the day after the announcement, with the S&P 500 pulling back 2.5%. Once again, that’s not the day bulls were hoping for after several up days in a row. Given all the uncertainty in the market these days, it’s important for investors to understand the value of hedging. That is, every investor who owns stocks should know how to protect against downside risk. 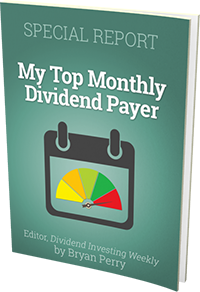 This includes those holding single stocks, ETFs, index funds, and other mutual funds. Essentially, downside risk can be hedged with any asset that makes money as the market goes down. It’s a way to counter the losses you may incur from your long stock/fund positions. The easiest way to do this is with inverse ETFs and options. Both inverse ETFs and options (long puts) are easy enough to implement as hedges. I’m going to focus on options in this article. In most cases, simply buying a put option on the asset you want protected is all you need to do. A put option will only cost a fraction of the cost of the stock, so even if you lose money on the put (which is preferable) you won’t sacrifice your upside return all that much (in most cases). And since options use leverage, if your put pays off, it can cover most or all of your losses on the asset on a down move. It’s easier to look at a hedge through an example. So here’s an actual hedge trade against real-estate stocks that recently hit the tape. By the way, that’s the beauty of an options hedge. You can pick the time frame you want, while protecting against any sort of asset class – as long as it has an ETF available (which is pretty much all of them). 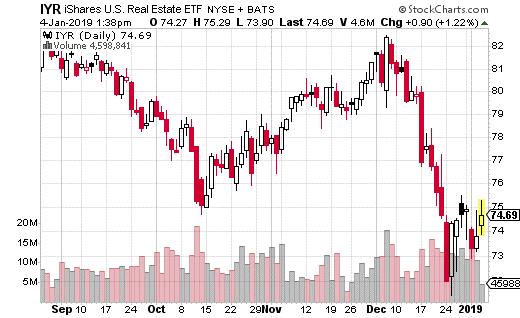 The trade I’m referring to occurred in iShares US Real Estate ETF (NYSE: IYR). With IYR at $74, the trader purchased the January 11th 71.5 put for $0.32. This is essentially a one-week hedge that protects against the real estate ETF falling below $71 (technically $71.18 is the breakeven point). The trader bought about 7,000 of these puts for roughly $220,000 in premium, which is also the max loss on the trade. However, if the market sells off sharply over the next week and takes real estate stocks down with it, the hedge will really pay off.